“This is one of the sectors that creates some of the most jobs, not just in the oil patch, but around the country in terms of manufacturing and support services, and this government will continue to do everything to promote the Canadian energy sector,” Harper told reporters in December 2011. But now, in the fall of 2014, Toronto Star columnist Chantal Hebert blames a hardnosed approach in Ottawa which she suggests jeopardised what might have garnered greater political support for its energy strategy from Canadians. “It is playing out in the courts, in the provinces and in public opinion, with the Harper government almost always on the losing side of the argument,” she wrote in a Sep. 27 column. Hebert was referring to efforts by the Harper government to loosen environment assessment rules, speeding up pipeline projects by gutting scientific research funding to investigate the climate change impact of fossil fuel emissions (including tar sands oil) on domestic regions like the Canadian Arctic, and to question the loyalty of environmental NGOs. “While the majority of Canadian voters support the development of Canada’s energy potential, most continue to expect their governments to act as honest brokers in the search for a balance between the economy and the environment,” she added. All the major pipeline projects designed to carry tar sands crude oil, which is extracted from the bitumen tar underneath the boreal forest and wetlands of northern Alberta, to markets in the U.S. and Asia (the later via British Columbia’s Pacific coast) are experiencing delays due to local and vocal opposition. These projects are all slated to be built by either Enbridge or TransCanada Pipeline, both major Canadian pipeline construction companies. 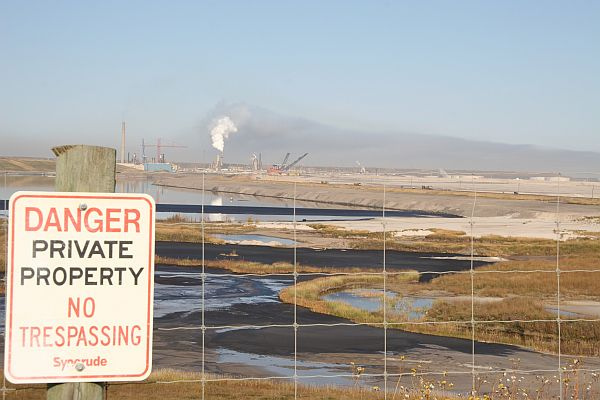 “Right now there are 2.2 million barrels per day of capacity, production from the tar sands. And the federal and provincial governments have jointly handed out permits to take that to five million barrels per day. That is a huge increase, even if they never approve another project, which they will, and the limiting factor in all of this is pipelines,” says Keith Stewart, climate change and energy campaigner for Greenpeace Canada. Despite occasional prodding from the Harper government, U.S. President Barack Obama appears loath to make a quick decision on the proposed Keystone XL pipeline from Alberta to the Gulf of Mexico because of stiff opposition from environmentalists, including some who are his supporters. Keith Stewart notes that the Conservatives face the prospect of losing parliamentary seats in the vote-rich Pacific coast province of British Columbia in the national federal election in 2015 because of concerns about potential oil spills from either of the two planned pipelines in the pristine wilderness environment. Northern Gateway, which has received formal regulatory approval coupled with 209 conditions, would travel across various First Nations indigenous territories in the BC interior to the coastal port of Kitimat. Supertankers would then load up the tar sands oil and navigate the narrow waters of the Douglas Channel for the open sea. Many commentators, including Stewart, are doubtful that the project will ever get built because of the legal challenges from the First Nations, whose lands claims were given further reinforcement in recent Canadian court decisions. The second project, by Kinder Morgan, is an extension of an existing pipeline in British Columbia that would slice through both wealthy suburban communities in the province’s lower mainland and First Nations territory. Then there is Energy East, which is currently at an earlier stage of regulatory approval than the other two pipeline projects. It would transmit Alberta tar sands crude oil from the west to eastern Canada, which currently imports foreign oil, and is supported to various degrees by all the three major federal political parties. But its route through Quebec has also ignited opposition because of climate change concerns. This is a province that prides itself on being green due to its reliance almost exclusively on hydroelectric power, “resulting in very low greenhouse emissions per capita,” adds Stewart. “There is not a lot in [Energy East] for Quebec. It is all risk and low reward. You are taking the risk of spills into the St. Lawrence River and into the drinking water,” he notes. Meanwhile, Jim Stanford, an economist with the UNIFOR union, warns of a boom-bust syndrome that is intrinsic to resource commodity investment. He says that tar sands oil is no exception to the trend. Stanford points to the slide downward in the world price of oil from the 100-dollar a barrel level – the minimum required by energy producers to justify ploughing money into the expensive extraction process of applying chemicals, water and machinery to dig the bitumen out of the ground. “Commodity prices go up and they always come down. And getting excited in a period of relatively high prices usually ends in tears [among the investors] when the prices come back down the other way,” Stanford says. Another economist, the Vancouver-based Marc Lee, observes that the Harper government is keen to extract as much tar sands oil as possible over a short period of time before renewable energies like solar and wind, with fewer consequences for the warming of the planet, come on stream at more affordable pricing. “The game changer in all of this is that the world’s governments are supposed to negotiate a new agreement to constrain fossil fuel emissions for 2015. [And] Canada may be forced kicking and screaming to stay within reasonable limits,” says Lee. Looming over all of this is Canada’s historical dependence on the development and export of raw resource staples, starting with trade in fur and fish from the New World to Europe under French and British colonisation in the 1500 and 1600s, says Mel Watkins, a retired University of Toronto political economist and the author of various books and articles on what he and others call the “staples theory,” to explain this country’s evolution. Other important resources for Canada have been lumber, minerals and petroleum. Watkins speaks favourably of the wheat boom which began in the 1890s and provided, he recounts, positive spinoffs for the Canadian prairies, including the spread of family farms, expansion of agricultural, railway construction and settling of new communities and towns. Watkins explains how the energy companies in Canada rely on foreign-made machinery to extract the tar sands oil and that once dug up the crude is invariably refined outside Canada. Furthermore, continues Watkins, the tar sands boom has helped to raise the value of the Canadian dollar and thus upped the price of domestically manufactured products in a competitive world market.